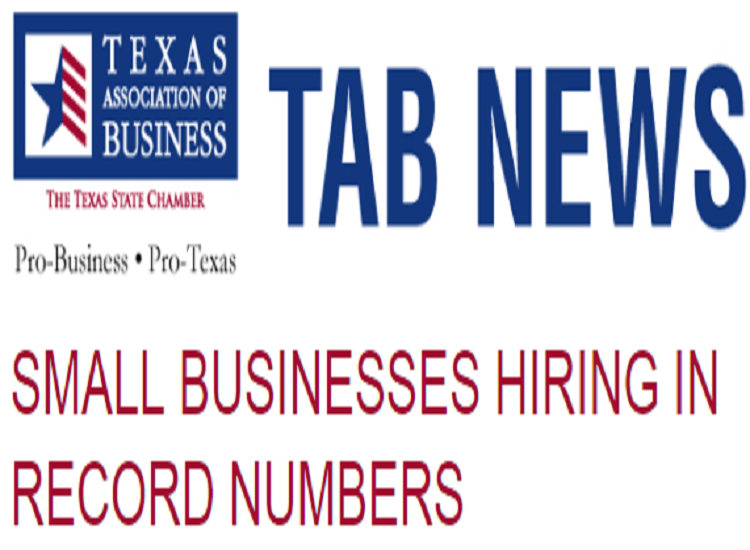 More than half of Texas Association of Business (TAB) members are small business owners. Small businesses drive the Texas economy and more than 2.2 million small businesses call our state home. A new survey by the National Federation of Independent Business (NFIB) shows workers are being hired at a record rate by small businesses, hitting a 12-year high. NFIB surveyed more than 1,700 small businesses across the United States revealing that small business owners added the largest number of workers per firm since July 2006. Economist point to a strong economy and 2017 revisions to the tax code benefiting non-incorporated businesses through lower individual rates and a 20 percent deduction for pass-through companies. Small business owners remain very optimistic, with 18 straight months of near record measures of owner optimism, unprecedented in NFIB’s 45-year survey history. This means that owners see much better returns on investments than in the 2008-16 period when optimism was below average every year. There is still work to be done at TAB as many of our members are actually being constrained by the economy's very strength: Low unemployment has shrunk the pool of job seekers and intensified competition for workers. Workforce competitiveness and readiness continues to be an area in which TAB has a focus and will work with members, legislators and state decision-makers on solutions as we go into the 2019 Legislative Session. To learn more about the National Federation of Independent Business (NFIB) survey, click here. Read More on Small Businesses Hiring here.